The Port of Long Beach. California's ports are a main battleground in the state's battle over who is and who is not an independent contractor. 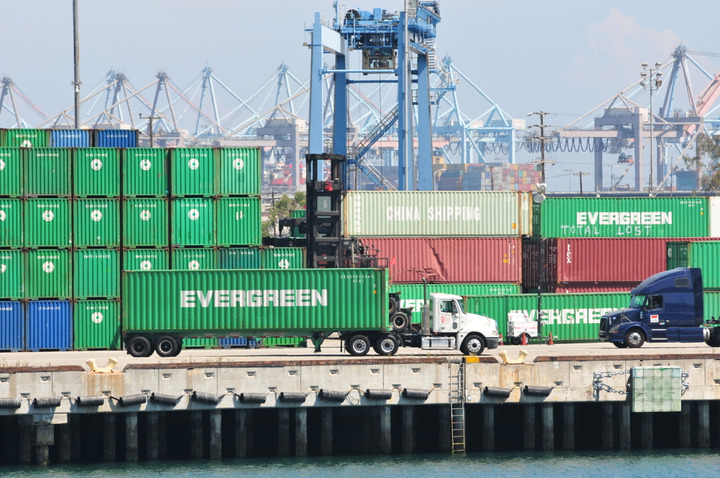 The California Trucking Association had filed suit against California Labor Commissioner Julie A. Su, whose office has ruled that port truck drivers are misclassified as independent contractors. In July of 2016, the CTA challenged what it called the California Labor Commissioner’s interference in motor carrier and owner-operator contractual relationships. That suit challenged the state’s use and application of the common law Borello independent contractor test through two lawsuits in both state and federal courts. The Borello test evaluates multiple factors to determine whether an individual was an independent contractor. Not all of the factors have to be met to establish independent contractor status, but the principal factor dealt with the company’s control over the contractor. CTA’s contention in its federal legal challenge was that the Federal Aviation Administration Authorization Act preempts the Labor Commissioner from interfering in the contractual relationships between motor carriers and independent contractors. The FAAAA is a federal law Congress passed in 1994; a provision of that law prohibits states from enacting laws that affect a motor carrier's prices, routes and services. CTA took it to the U.S. Supreme Court, which declined to take the case. The Teamsters union, which has been fighting to get drayage truckers at California’s ports reclassified as employees rather than contractors, praised the Supreme Court action. “In rejecting the CTA’s appeal, the highest court in the land has effectively closed the case on predatory trucking companies’ efforts to dodge taxes and steal the hard-earned wages of drivers through a scheme that illegally classifies drivers as independent contractors,” said Fred Potter, director of the Teamsters Port Division. But there’s another, potentially even bigger case involving contractors still in the courts. Another lawsuit regarding California’s stance on trucking and independent contractors is still being litigated. In September of 2018, the CTA and two owner-operators filed a lawsuit on the application of the recently adopted “ABC” worker classification test as defined in the Dynamex decision. That case, California Trucking Association et al v. Becerra et al, continues to be litigated. In a letter to CTA members, Yadon noted that in last September’s rejection of the Su case, the Ninth Circuit Court of Appeals stated the very recently adopted “ABC” test as outlined in Dynamex v. Superior Court was “likely preempted” by FAAAA. “This opinion led to a successful precedent in Alvarez v. XPO, the first district court case to find the Dynamex ‘ABC’ test preempted by the FAAAA,” he said.